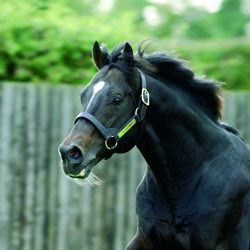 Elnadim, the Champion European Sprinter in both 1997 and 1998, was laid to rest at his Derrinstown Stud home last week. Bred by Shadwell Farm in America, Elnadim was by Danzig out of Elle Seule, whose other progeny included the Classic winning Champion Mehthaaf and Only Seule, the dam of Champion Occupandiste, herself grandam of Champion Intello. Elnadim raced in the colours of Sheikh Hamdan Al Maktoum, for whom he won five races, including the Group 1 Darley July Cup and Group 2 Diadem Stakes. Retired initially to stand at Shadwell Farm in the USA, Elnadim was then brought back to Europe where breeders were better acquainted with his racing qualities. He soon carved out a reputation for himself as being a credible source of precocious speed and amongst his most notable successes were the Group 2 Queen Mary Stakes winner Elletelle (now dam of the dual Group 1 winner, Adelaide); the Group 2 Flying Childers Stakes winner Wi Dud, and the Group 3 winners Soraaya, Elnawin, Pasar Silbano, Caldra and Al Qasi. He was also to meet with considerable success in the Southern Hemisphere, where his standout performer was the Group 1 winning sprinter Culminate. Elnadim was retired from stud duties at the end of the 2014 stud season but as age took its toll on the 21 Year-Old and as his chronic arthrosis grew more debilitating, it was decided to put him down on humane grounds.